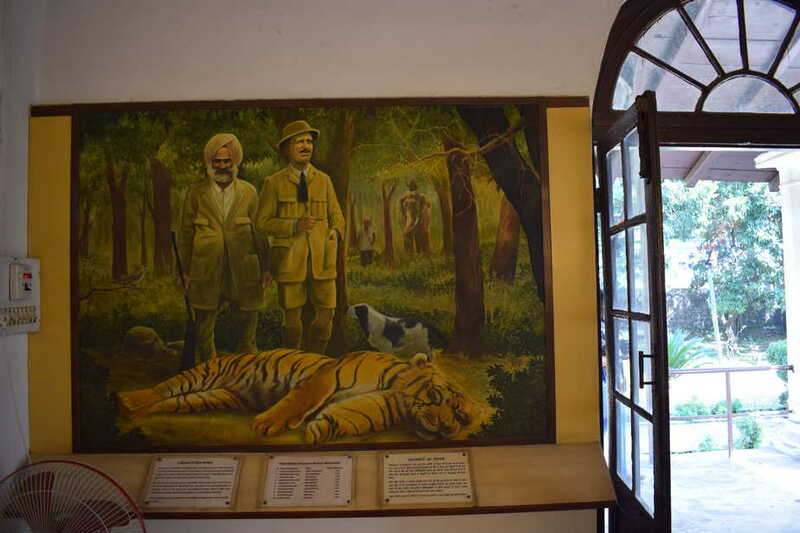 A Britisher in India, an army man with a moustache, wearing a hat and shorts, with his feet resting on a slain tiger… “Would I call him a hero?”I wonder, standing before the painting of the iconic Jim Corbett. This is no Tom Cruise or Tarzan. This is a real man who dared! I shake myself out of the reverie for my love for wildlife is a fairly young one, and Jim Corbett was born on July 25, 1875. We are at the Jim Corbett Museum in Kaladungi, near Choti Haldwani village. 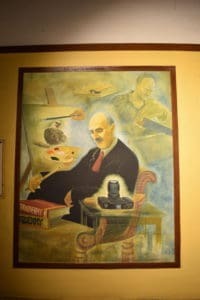 I read many of his letters framed on the walls of the museum. Manicured lawns, wooden benches, organic products and a cool breeze, I wonder why does bliss comes once in a blue moon or should I say under the blue sky? Sighing, we walk around to discover the graves of his beloved dogs — Robin and Rosina. He truly loved animals, to give them this honour. This was his winter home. Corbett was born and lived in Nainital in Gurney House (in pic). His sister, Maggie, was his companion till his death in Kenya on April 19, 1955. While I had visited the area during my school days, I was ignorant about his persona till this trip. For me, Corbett meant a safari to spot a tiger. 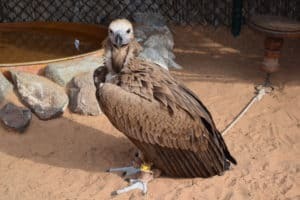 I didn’t spot a tiger, but birds and other animals filled me with joy, thanks to the man who worked to save them. He was loved for he hunted man-eaters and saved the villagers. But later, he began to protect the very fauna that he once used to kill. He took photographs of the wild ones and even established the village of Choti Haldwani, which he gifted to the villagers when he left India. He was a colonel in the British Army and also worked with the railways. Corbett left for Kenya when India attained independence in 1947. As his primary work had been that of a real estate agent, the winter home was given to Chiranji Lal Shah because Corbett owed him `14,000. In 1965, the government of India bought it from Shah for `20,000. The village land, all of 221 acres, he had bought from Guman Singh Barua in 1915 for `1,500. Here, he introduced irrigation projects, got a wall built to prevent animals from coming in and donated to schools and churches. He framed many wildlife conservation laws in the area and the park zone was initially called Hailey National Park, after Sir Malcolm Hailey who was the then governor of the United Provinces. This was 1936. 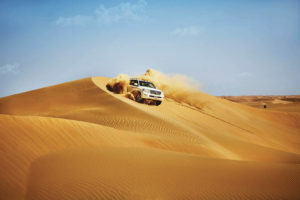 The park is said to be the first national park in Asia. In 1957, the national park was named after Corbett as a mark of respect for his love for wildlife. Project Tiger was launched here in 1973. The village is right behind the museum and houses a homestay, Ittu Sa restaurant where a traditional Kumaoni meal costs as little as `250. But the treasure is the single-barrel, muzzle-loading gun, which is now the pride and joy of Trilok Singh Negi. 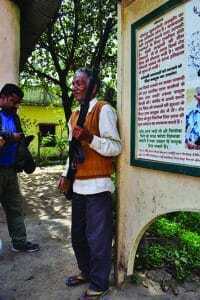 The gun was gifted to his father Sher Singh Negi by Corbett. Singh fondly recalls he was called Carpet Sahib and that his father used to go with him for shikar. There are heritage walks here but we are in a hurry to see more landmarks a little ahead. I feel ashamed that I haven’t read Man-Eaters of Kumaon. If I had read it, I would be able to relate to this spot where the last tiger, the Bachelor, had been killed by Corbett. This huge tree, a 100-year-old semal tree, is a witness to this feat. But the gates are locked. We go through the shrubs to pose before the trunk where the Bachelor had been put to death. The Bachelor was a magnificent Bengal tiger, 3.23 metres long between pegs, and the only non man-eater that Corbett killed. 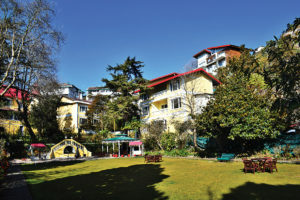 Do visit Gurney House in Nainital if you get a chance, says someone. These are prophetic words. 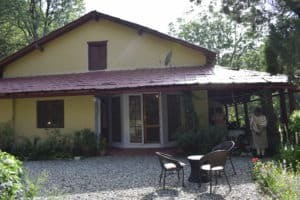 It’s just been a month since my return from Corbett and now I am in Nainital, visiting a heritage property, Ashdale, owned by Reena Kumari. She belongs to the royal family of Sahaspur-Bilari. The Corbetts used to be part of a parish church called St John’s in the wilderness which is right next to Ashdale. I walk around this gothic structure as children practice taekwondo on the grounds. 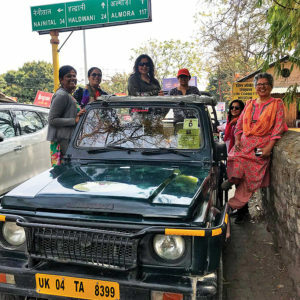 Gurney House is not far and to my luck, the owner Nilanjana Dalmia arrives from Delhi. I am jumping with joy, but unfortunately, I can’t jump high for I am wearing the wrong shoes to walk on the curvy mountain roads. Dalmia is showing some school children around the house, which has a lived-in feel. They are not some impersonal walls with lots of artifacts, but a home. “I have tried to keep it as close to the original as possible, even though taking care of an old property is no easy task,” she smiles. On every birthday, she hosts a meet in the memory of the iconic man. We walk around, oohing and aahing at every step. There is the vault where he kept his money. The windows are old-fashioned, the trophies (deer heads) look at us from the walls, the chair that Maggie sat on calls us, there is an old African drum — it’s a home full of priceless treasures. And then I sight the cutlery, the little English cups and saucers. I sit on the dining table where Corbett ate his meals — on the very chairs. Life is bliss and it’s a blue sky outside. “I bought this house from my father in 2006,” says Dalmia. “The home belonged to Maggie, who sold it to Kalavati Varma for `50,000. Then my father bought it. This building is over 130 years old.” Gazing at the well-kept lawns, the old wooden floors, the beds, the piano and the photographs, you long to know the man who left behind so much goodwill for man and animal alike. But a car is waiting and my tryst with Corbett hasn’t ended. I am going to stay in the forest at lebua Corbett.